Part 1: 2012-2013: Quotes. Background. New varieties of vegetables in Cuba. Canada's arctic ice cover shrinks. There is a very strong and well financed climate change denial movement, particularly in North America. Some of their efforts are directed at denying that climate change is actually happening; the rest admits that climate change is a reality but denies that human factors are causing it. Countering this are many findings of climate researchers who are measuring hard data related to ongoing climate change worldwide. 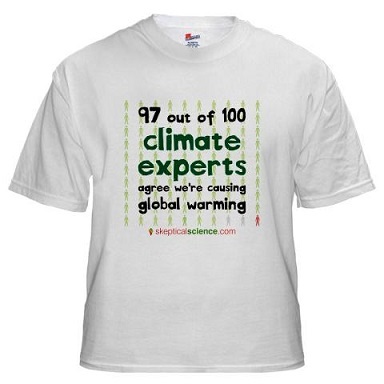 Actually, the T-shirt should say that 97% of scientific articles on climate change that mention its cause agree that it is primarily caused by human activity. During 2009, the Economic Commission for Latin America and the Caribbean (ECLAC) forecasted a relatively mild impact on climate across the region due to global warming by 2020. However, they predict a particularly acute impact in the second half of the century. Some of the changes expected due to global warming are more forest fires, floods, droughts, and more intense storms and hurricanes. Developing countries and island nations like Cuba will have to adapt to climate change. One response is in the development of new varieties of resistant vegetables. They are being grown by researchers in Cuba, who for decades have been working to design plants adapted to the tropical conditions in the Caribbean region. "We are now focused on trying to develop new varieties, with a view to climate change." Today, they are studying more than 30 species of vegetables, to develop resistant varieties. These include tomatoes, peppers, onions, garlic and cucumber -- some of the most widely consumed vegetables in Cuba. Others are melons, watermelons, carrots, beans, aubergine and lettuce. Developing a resistent variety can take from five to 15 years. "... were adapted to periods when it didn’t rain and relative humidity was low. [They] are now facing the opposite conditions. So they are attacked by fungal diseases, caused mainly by excess moisture." 63% of those sampled believe that global warming is happening; 16% deny it. 49% believe that if global warming is happening, it is caused by mostly human activities. 42% believe that "most scientists think global warming is happening;" 33% believe that there is widespread disagreement among scientists about the reality of warming. 51% say they are "somewhat" or "very worried" about global warming. 55% believe that global warming is a threat to persons in developing countries. 38% believe that people around the world are being harmed by climate change. 34% believe that fellow Americans are being harmed. 63% believe that global warming will negatively affect future generations of humans. One cause of the sluggishness of the public to demand action is found in our brain circuitry. Over most of the history of the human race, people's brains have tended to react instantly to immediate threats. However, they tend to pay much less attention to future, slowly approaching threats. Today, this response may result in a major catastrophe. Warming in the polar regions is reducting the extent of Arctic sea ice. Less sea ice increases the area of open water in the Arctic. More open water adsorbs increasing amounts of heat from the sun. Back to step 1 and repeat endlessly until all of the ice has melted. Warming in the polar regions is melting wide areas of permafrost. This term refers to areas of the surface of the Earth that are normally frozen year around. Melting permafrost releases gasses such as methane into the atmosphere that had been previously trapped. Methane intensifies the atmosphere's greenhouse effect which causes the atmosphere to retain more of the Sun's heat. Back to step 1 and repeat endlessly until all of the permafrost has been eliminated. From about 1980 to 2010, India and Bangladesh had been in conflict over the control of a tiny rock island in the Bay of Bengal. It is called New Moore Island by India and South Talpatti by Bangladesh. It is one of the Sunderbans chain of islands. Climate change is warming the earth generally. This causes glaciers in Greenland, the Antarctic, and elsewhere to melt more rapidly, pouring water into the oceans and increasing the ocean level directly. A warming Earth also warms up the oceans which makes the ocean water expand, further increasing the ocean level. This increase in ocean level has caused New Moore Island in the Bay of Bengal to be completely submerged. For a while, will be a shipping hazard. However. it is no longer an island. He noted that Lohachara island in the same chain became completely submerged in 1996, forcing its residents to move to the mainland. Also about half of the land area of Ghoramara Island is currently underwater. Ten or more other islands in the area are at risk. "We will have ever larger numbers of people displaced from the Sunderbans as more island areas come under water." 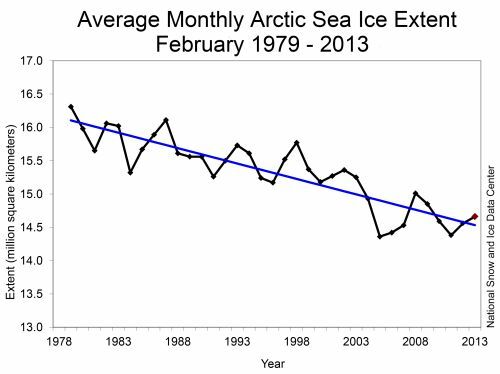 The blue line shows a linear decline in area of 2.9 percent per decade. As noted in the Background topic above, this rate will probably accelerate in the future.